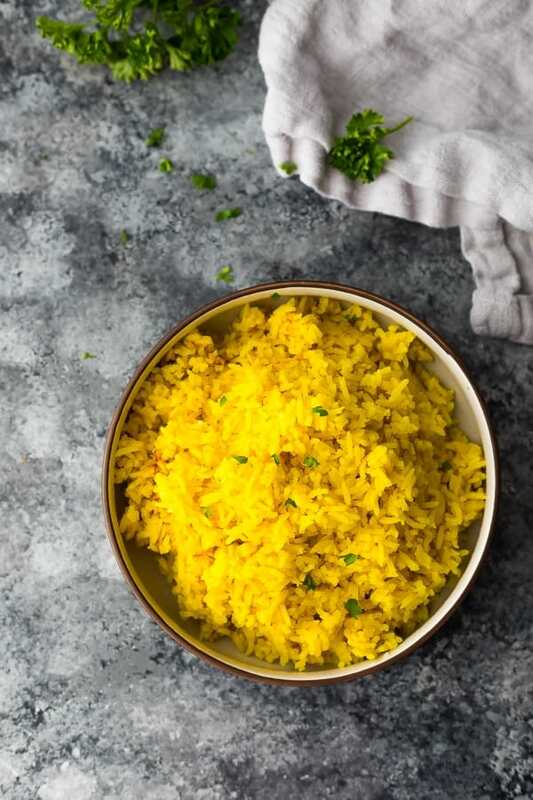 This turmeric yellow rice is full of aromatic flavors and makes an elegant side dish! It is simple to make and can be cooked in a rice cooker or on the stove top. Is rice a staple in your house? It is most certainly a staple in ours. We eat rice 2-3 times per week, and I’m on a mission to jazz it up a bit…no more boring plain rice! 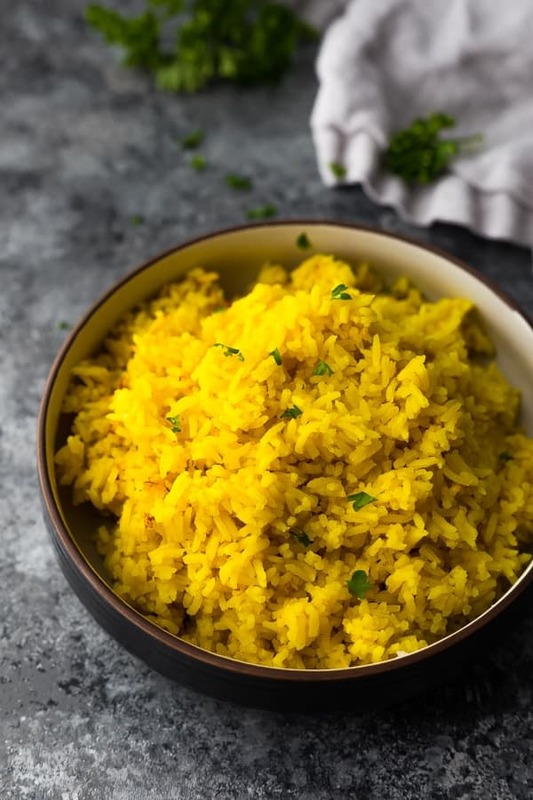 This turmeric yellow rice is one of my favorites in the bunch, and it was my 4-year old Kai’s favorite recipe. 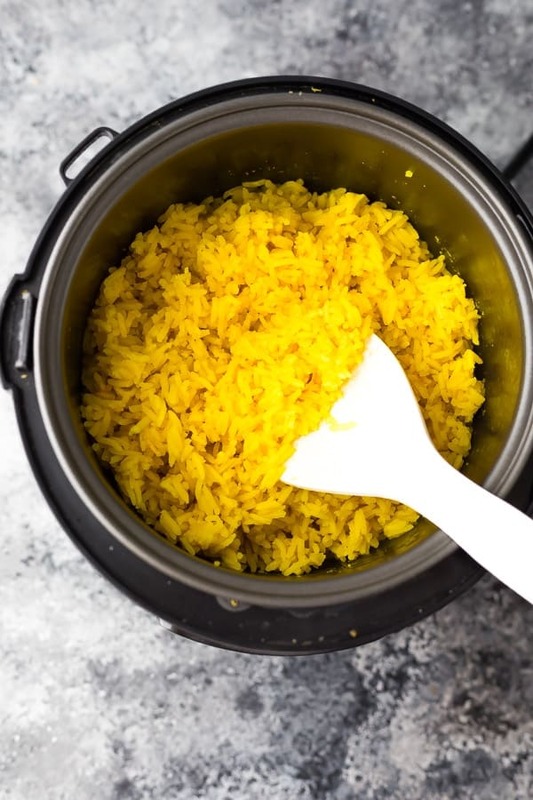 He always asks if we can have the ‘yellow rice’ again…how I love to hear that! Not only is it delicious, but it’s super easy to throw together. 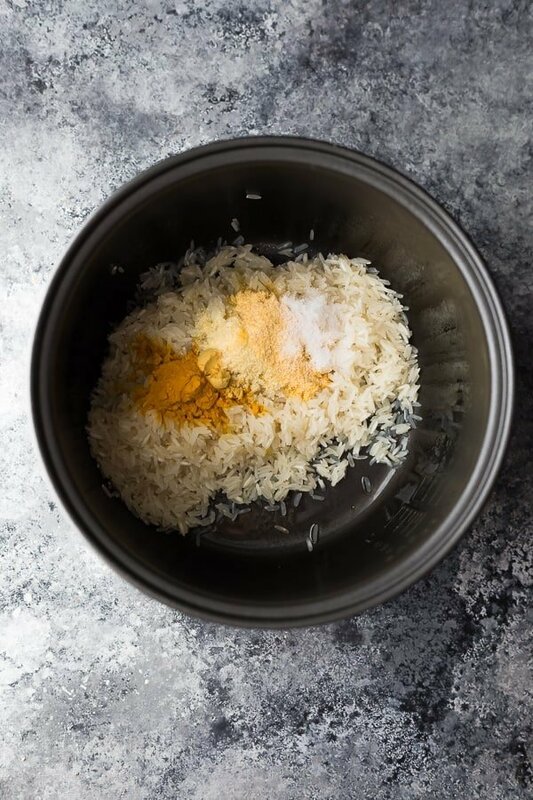 Traditional yellow rice recipes require chopping and sauteeing, but I’ve cut a few corners so that we can have this prepped and cooking in under 5 minutes, and we can even make it in the rice cooker, too! Can I use jasmine rice in this recipe? Brown rice? Any other rice? 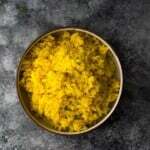 For this yellow rice recipe, any long grain white rice will do (basmati or jasmine). Brown rice can be used but adjust the liquid and cook time according to the package. Short grain white rice or par-boiled/pre-cooked rice won’t work in this recipe. 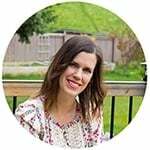 Can I cook this recipe in the Instant Pot? I have not tried. 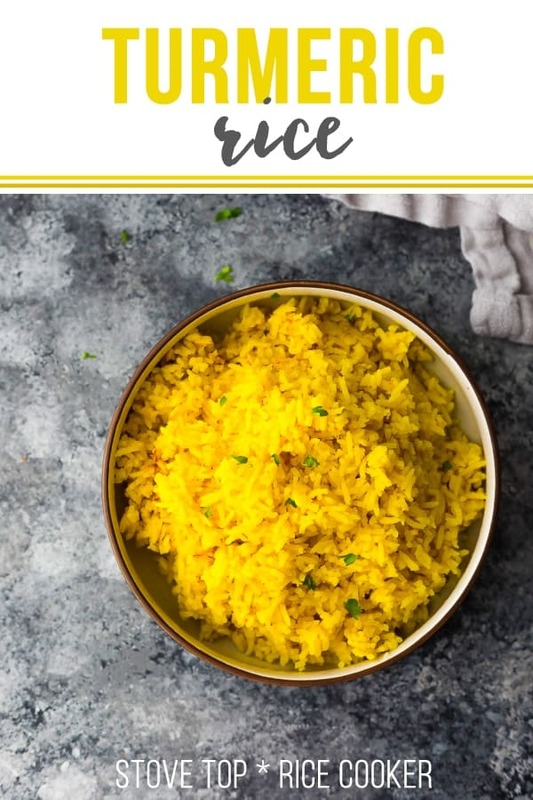 I would refer to this recipe for Instant Pot Yellow Rice. 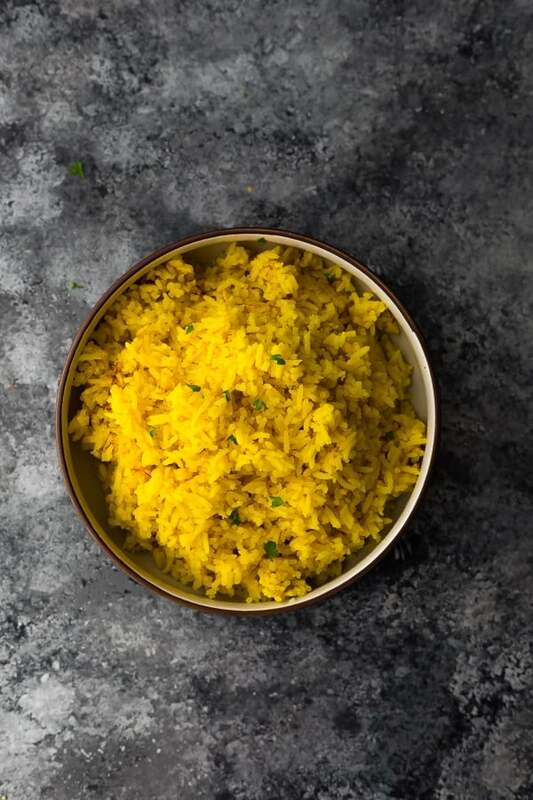 What goes well with this turmeric yellow rice recipe? Remove from heat and let sit for another 10 minutes before fluffing with a fork and serving. Combine the basmati rice and all other ingredients. Once the cook time is up, fluff with a fork and enjoy! My son likes to take brown rice for work lunches and wanted something different than plain but not fried. This was simple and is a great change from plain. I made a double batch and froze in portions. He likes the flavor. I did rinse the rice and then heated the oil and ‘fried’ the rice to bring out the flavour. I mixed all the spices in a small dish to combine evenly and added to the rice and ‘fried for about a minute prior to adding the liquids. (heard somewhere this brings out the flavours). I simmered for 30 minutes and then left for 15 minutes without removing the lid, fluffed with fork and it turned out perfect. This is a keeper. Thank you for putting this delicious recipe out there for people like me looking to up the plain old. Thank you so much for taking the time to leave such a thoughtful review! I just finished making the Turmeric Rice dish. It’delicious. I will be stuffing my red, yellow and orange bell peppers with the rice along with a ground turkey tomato sauce topped with grated parmasean and romano cheese and baked in the oven for about 30 minutes. Thank you again. The rice is truly delicious. So happy you enjoyed, Louise, and your stuffed peppers sound delicious! Thanks so much for taking the time to leave a review.